It may seem obvious that Christmas is a Christian holiday. The very name of the day suggests a celebration of Christ, and certainly many have bemoaned the fact that Xmas seems to have lost its religious meaning under a barrage of commercialism. Back in the 1950′s the satirist Stan Freberg released a classic record called “$Green Christmas$” which savagely criticized what Christmas had become even then; its chief sound effect was the ringing of a cash register. Behind all the criticism was then – and is now – a belief that Christmas had once meant something it no longer means, that what was originally the celebration of a religious figure has been twisted into a callous, materialist frenzy of buying stuff. In America, we are reminded, the idea of a Christmas celebration didn’t really take hold until commercial interests recognized its potential and began to sell it like corn flakes. The growth of Santa as the predominant icon of Christmas in much of the world grew out of the efforts of retail wizards such as John Wanamaker and Rowland Hussey Macy, founders of the modern department store. Much like the early church fathers, Wanamaker and Macy systematically laid claim to a Christmas of their own making in the 19th century.By this point, said Russell W. Belk, a sociologist and anthropologist at York University in Toronto, Christmas had already been through several incarnations — Christians in the United States had initially resisted Christmas because it was seen as tied to the Catholic calendar, but waves of European immigrants brought traditions of Christmas celebrations with them. Still, the idea of giving gifts to relatives was not the norm, especially among English immigrants, where Christmas gifts were primarily seen as acts of benevolence toward servants and slaves. Business magnates who had once protested that holidays such as Christmas were a drain on the economy spotted the business potential of Christmas and encouraged the idea of gift-giving among family. Where Christmas gifts had once been primarily about charity, advertisers and marketers encouraged the notion that Christmas was primarily a family celebration and stressed the importance of reciprocal gift exchanges for friends and relatives. By the 20th century, American marketing geniuses led by Coca-Cola had seized on the advertising potential of Santa Claus. Although Santa’s ancestors in Europe and Asia had various religious connotations, the modern Santa is an American invention, with growing appeal in Europe and around the world. It doesn’t actually. “Santa Claus” is from the Dutch for Saint Nicholas – Sinterklaas – and the color red was always associated with the Greek St Nicholas who is the source of the icon. (More about him later.) Coke’s artists merely appropriated an image already made famous by Thomas Nast in the 1870′s and 80′s, an action that is fairly symbolic of how the holiday actually developed. The trappings of Christmas are almost entirely pagan in origin. Christmas trees, the lights on both trees and homes, wreaths, caroling, Santa Claus, the exchange of gifts – all of it was born in pagan solstice festivals beginning, as far as we can tell, long before Christ’s time. In the context of the solstice, it all makes perfect sense. In a Christian context, they simply don’t belong. What does Christ, a product of the Judean desert, have to do with pine trees, after all? Nothing. Christmas trees – Probably born in Germany or the Nordic countries, the ritual symbolism of the solstice evergreen was just that: it was ever green. Unlike the deciduous trees that dominated the forests of northern Europe whose leaves died and fell away as winter began, fir trees remained green all year round. They were the perfect representation in pagan societies for the persistence of life and the fertility of the earth on which those societies depended. Druids (the real ones, not the pale, bogus artifices we know today) worshipped trees, evergreens in particular, because they believed they were the earthly incarnations of spirits and/or gods. Evergreens were believed either to be or to be the homes of spirits who controlled the sun and had the power to bring it back and renew the earth for another year. The custom of bringing a tree inside, almost certainly German, probably began as a form of pagan tree-worship. Lights – As the days shortened and the sun threatened to disappear, the long nights became a source of real fear, not just because folk believed it might vanish but because they believed that evil spirits lurked in the dark, and the longer the nights were, the more chance there was that these monsters would wreak havoc on their villages. The solution, of course, was a Festival of Light held, naturally, on the one day of the year that had the least of it. There were torch parades and candles were kept burning all night. When the trees came inside, so did the candles, and by the Victorian era the candles had become attached to the branches of the tree. Wreaths – Common to many cultures, wreaths were either worn, as in Rome, or displayed as signs of either special favor or protection from evil. Long before trees were brought into the house, wreaths were attached to doorposts, connecting the magic of the evergreen to individual homes. Caroling – Noise has long been believed by many peoples to scare away evil spirits. In China they beat drums and gongs, in Europe they sang. The origin of this particular custom (called “wassailing” in Britain) is lost to history but it isn’t unreasonable to assume that it was a natural addition to all the other anti-evil charms employed by our ancestors. So is dancing, of course, so it isn’t surprising that the two were combined. In fact, the original meaning of the word was “circle dance” and was most likely an integral part of the midwinter ritual. We don’t do the dancing part much any more, and it’s too bad. Santa Claus – Unlike the rest of our Christmas traditions, Santa Claus does have some slight connection to Christianity. 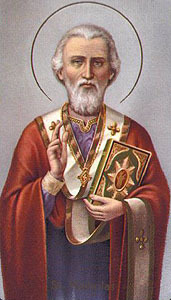 Born to wealthy and devout Christian parents in Patara, then a province of Greece, St Nicholas is supposed to have taken the words of Christ to heart and given away the whole of his large inheritance to relieve the suffering of the poor and the sick. Though he was never ordained, his reputation for piety was such that he was made Bishop of Myra while still a young man. Persecuted and imprisoned by the Emperor Diocletian, he returned to Myra after his release and died there on December 6, 343. For many years after that, the anniversary of his death was celebrated as “St Nicholas Day”.Co-incidence? Sort of. The fact that he died in December only a few days before Saturnalia (the Roman midwinter festival) connected him quite naturally to what became Christmas when the Catholic Church appropriated midwinter festivals for a celebration of the birth of Christ. After centuries of trying unsuccessfully to stamp out these primarily pagan rituals, the geniuses in the Church came up with a brilliant idea: if they couldn’t be stopped, they could certainly be swallowed up – assimilated by the Church and given a Catholic context. This was to prove a valuable and almost universally successful tactic in the centuries to come.St Nicholas Day melded rather naturally into the solstice festivals and it wasn’t long before St Nick and Christmas were inseparable. In many parts of Europe, Dec 6 is still celebrated as both.It should be noted that the St Nick we know is neither Greek nor terribly Christian. He’s Dutch. Sort of…. The giving of gifts, stockings over the fireplace, and coming down the chimney– Both of these customs arose not in Europe but – are you ready for this? – here. In America. In New York, in fact. So Washington Irving invented the Santa Claus we know more or less out of whole cloth, relying on legends (as he often did) and embellishing until the original story was barely recognizable. Irving entirely ignored the religious connotation of the title “saint” and any overt connection to religion, let alone to Christ. His St Nick was already 95% secular, a cultural symbol closer to solstice celebrations than Christian ones. The total secularization of St Nicholas, morphing him into the Santa Claus we know, was accomplished by only two men: Clement Moore (probably) and Thomas Nast. Moore is generally credited with writing A Visit from St Nicholas(“‘Twas the night before Christmas/and all through the house….” – you know it) for his children in 1822. It forever identified St Nick with the roly-poly, “jolly old elf” of Irving’s story and pretty much divorced him from any possible religious significance. Fifty years later, what Moore had done with words, Nast did with pictures. 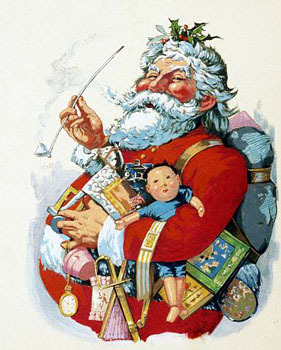 His cartoons of Santa Claus formed our visual image of the old guy once and for all. Following Irving and Moore, Nast’s Santa is no more a religious figure than, say,Uncle Sam. Of all the traditions we associate with Christmas, only three are overtly religious: the Nativity Scene, the angel on top of the tree, and going to church. Many Christian churches have the former and most Christians do the latter on Christmas even if they never go the rest of the year. By my count, that makes Christmas roughly 87% secular whether Bill O’Reilly likes it or not.